The Opportunity Green Business Conference, the preeminent sustainability forum facilitating exchange of ideas and sustainable business solutions, brought together over 900 Fortune 500 business leaders and entrepreneurs from around the globe to showcase the most sought-after opportunities, profound innovations, technologies and trends accelerating the new green economy through an exchange of ideas on how to implement environment-friendly business practice, clean technology and innovation. The fifth annual conference, which took place November 10 and 11 at Los Angeles Center Studios, featured the much anticipated OG25 eco-startup competition, dedicated to environmentally responsible innovation and entrepreneurship. 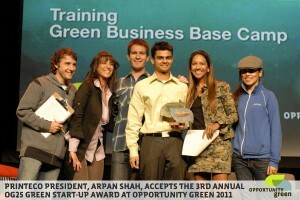 The contest showcases twenty-five of the most innovative eco-startup companies across the country. These 25 finalists – representing the best and brightest entrepreneurial initiatives in clean technology, transportation, infrastructure, social innovation, water management, food systems, community development and more competed in a fast pitch (one minute) presentation in hopes of being named “OG25 Green Start-Up of the Year”. Several hundred companies were nominated for the prestigious award through Opportunity Green’s website, recommendations by Opportunity Green staff and expert consultants. Nominations came from a variety of sectors, including water conservation, waste management, food systems, product design, social innovation, transportation and mobility, and resources conservation. To be nominated companies should be in business less than five years, have fewer than 50 employees and less than $5 million in revenue and were selected based on the combination of innovative thinking, potential for impact and execution of their idea. 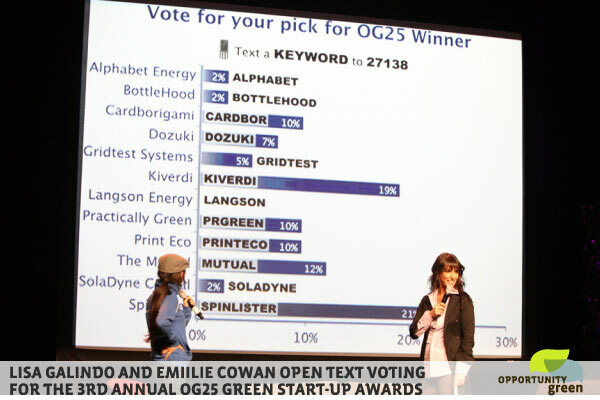 PrintEco was selected by the attendees via real time text as the OG25 Start Up Winner. PrintEco Office is a suite of plug-ins for Microsoft Excel, Word, PowerPoint, Internet Explorer and Firefox, which automatically optimizes and prints documents in a few seconds, making the least financial and environmental impact possible thus cutting down on “carbon emissions, not trees” and reduces printing costs by 17%. PrintEco received We Are Plus‘s $25,000 Brand and Marketing Package. We Are Plus is a marketing firm dedicated to strategic insights and creative solutions; their team of expert marketers is committed to building brands with purpose designed to meaningfully engage with audiences. Arpan Shah, President and Co-founder of PrintEco was excited to be the recipient of this year’s Competition. This year was the most interactive and influential experience yet! Thank you to Pam Schultz and Emilie Cowan, who managed this year’s OG25 Awards Committee. In an interview Arpan Shah said that he developed a software that helps companies and consumers reduce their paper and ink usage with a simple click of a button… innovative, Well done Shah!